Almost since its introduction in 1999, the ACUVUE® 2® Brand has been the best-selling hydrogel contact lens in the market because they are easy to apply and remove, and provide crisp vision. 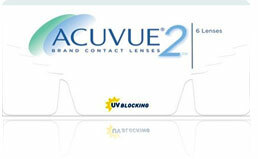 Comfort and freedom are what ACUVUE® 2® Brand Contact Lenses are all about. The lens is designed to be worn as a two-week daily wear lens which means you take the lenses out each night. One lens can be worn up to 14 days. They can also be worn as an extended wear lens which means you can sleep in them for up to six nights. Ask your eye doctor which wearing schedule is right for you.